Sums to 5. Start small with addition problems with sums up to 5. Instead of using your own fingers you could count the bear print fingers and toes! Sums to 5. Addition problems with sweet cherries hanging around. Add and write the sums on the lines. Color the cherries a nice bright red. Sums to 7. 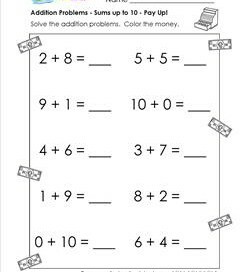 Solve these addition problems and write the sums on the lines. Milk chocolate or white chocolate chip cookies? Color the cookies. Sums to 7. Yikes! Look out for the creepy crawly spiders dropping in to practice some addition problems. Add using counters or your fingers. Addition Problems – Look Who’s Adding! Sums to 9. Who, who, who. 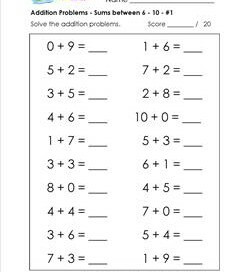 These addition problems are for kids who are smart owls. 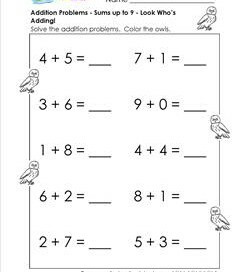 Try adding without counting fingers to see if you’re a super smart owl! Sums to 9. 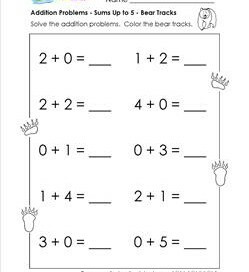 Have a roaring good time solving these ten addition problems. Write neatly. You should always do your best work and I’m not lion (lyin’). Addition Problems – Pay Up! Sums to 10. 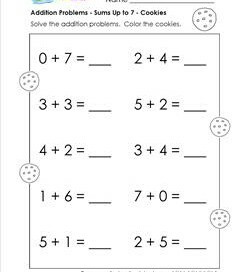 Cash in on the chance to solve these ten addition problems. Add then write the sums on the lines. Color the money and the cash register green. Sums to 10. 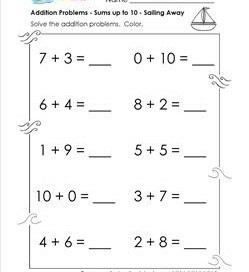 Relax as if you were sailing away along some nice cool breezes and solve these simple addition problems. Don’t be blown away by how easy they are! Sums to 10. An apple a day is really good for you. 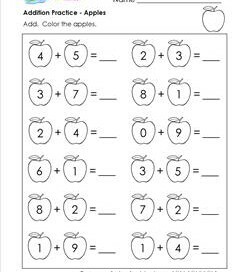 Add the numbers in the apples in these addition problems. Color the apples in an apple-colored pattern. Sums to 10. 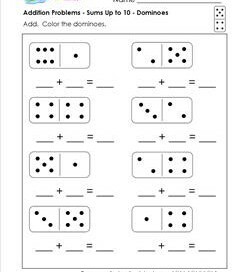 For these addition problems write the addends as the number of dots on each end of the dominoes. Add. Write the sums. Sums to 5. This addition problems worksheet has 20 problems with sums up to 5 and a line for scoring the number correct. Simply solve the problems. Sums to 5. More addition problems with sums up to 5. 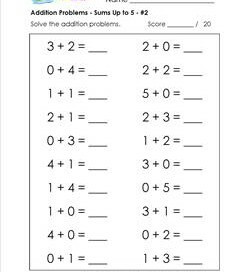 There are 20 problems and a line for scoring the number of problems solved correctly. Solve the 20 addition problems with sums between 6 and 10. Use the line to score the problems solved correctly. Twenty addition problems with sums between 6 & 10. 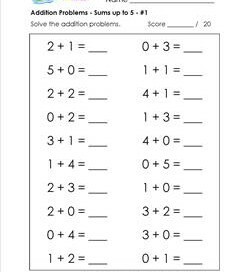 Use the line to score the number of problems solved correctly.